Mural is now installed at the CarePartners therapy pool. If you witnessed the creation of the 8′ x 24′ explosion of color and form that is the Jonas Gerard mural titled ‘Passionatley Alive,’ then you contributed to the birth of the artwork itself. Jonas believes in letting go of all preconceived expectation when creating art. Similar to a medium channeling spirits from beyond, Jonas taps into the live energy felt in his performance space, allowing the creative source to be wide open and the paint brushes to do as they please. During the River Arts District Fall Studio Stroll in Asheville, Jonas painted the abstract mural in his spontaneous style. The public was invited to watch the expressive artist at work and there was a full house at Jonas’ studio at Riverview Station. Covering the surface area of this large scale mural was no small feat for a seventy five year old man and his three assistants. 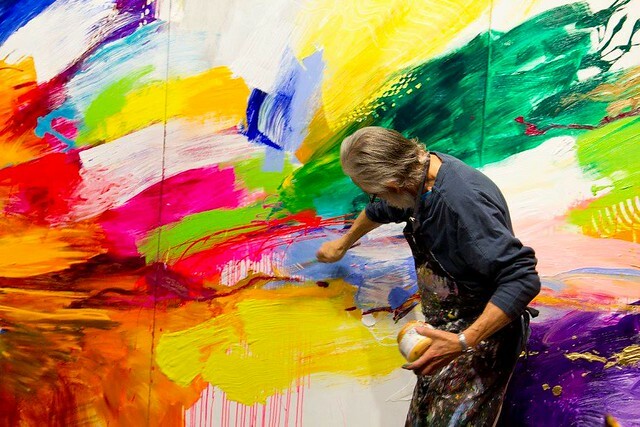 Driven by an eclectic mix of rhythmic music playing from the sound system, and channeling the focus and energy of the captive audience, Jonas engaged in his action painting techniques. This new large scale mural, which is Jonas’ second to date, was successfully installed at the CarePartners Health Services therapy pool in January, 2017. Jonas Gerard Fine Art was honored to partner with the CarePartners Foundation for this meaningful project. Installation of this mural realizes Jonas’ vision; to bring the healing power of art into a space where people are working hard to improve their lives. Touched by his own experiences with pool therapy, Jonas felt inspired to improve the healing environment in the most effective way that he knows, by transforming a space with art. JGFA would like to thank everyone who was present during the creation of the mural at the River Arts District Fall Studio Stroll. Your attention was a direct influence on the creative energy responsible for the artwork itself. As participants, you have contributed to the healing vibrations that will benefit so many lives. *Please note that this art installation is not on public display. The pool is in a controlled therapy environment. We will share pictures and eventually video of the mural for your viewing pleasure. You can also see a video about the creation of Jonas’ first mural, ‘Life Love and Passion’, which was painted in 2015 and was the original inspiration for Jonas’ interest in large murals. This entry was posted in Art Blog, In The Studio, Inspiration, Studio Stroll and tagged abstract art, Abstract Expressionism, Action Painters, art blog, Asheville Art Gallery, asheville art studio, Fearless, large mural, mural painting, River Arts District, Studio Stroll. Bookmark the permalink. Just breathtaking – JDFA is blessed to have your beautiful work for its clients….love its reflection in the pool – and the original inspiration work too. Wish I could have witnessed their creations. Mazel Tov dearest Jonas. P.S. I so love your paintings in my home!!!! Loved the energy and colors of your work. I’m inspired to try some of your techniques in my work.